Corporate Gifts From A PIN TO A PLANE! MOUSE PADS:- Mousepad can be made of foam and rubber bottom base with your artwork at the top to remind the user about you and your products 24×7. The printed top sheet can be protected through lamination to increase the life of the mouse pad and with knurling at the top to ensure that cursor of optical mouse behaves and is under your control. HP still uses the garage story to impress the target audience and shape & size can be customized for greater mileage. 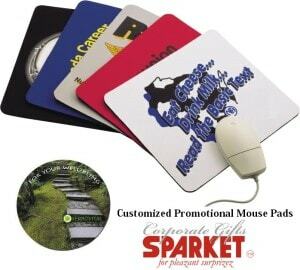 You can insert a postcard size photograph to make personalized mouse pads and for greater comfort one can order with palm rest filled up with gel. COASTERS:- Coasters can be made single or in a set of 2, 4 or 6 and choice of materials to choose from is very large starting from foam, rubber, leather, plastic, acrylic, steel, wooden, brass, metal, silicone, glass, cork, tin etc. Depending on the choosen material you can have branding on both sides and even a yearly calendar can be made to impress the target audience. You can further add led lights to highlight the brand with added mechanism of light glowing when the glass is picked up or put down on the coaster. The container to keep the 4 or 6 coasters when not in use can be designed to highlight the brand through unique features. APPARELS:- T-shirts, caps, jackets, hoodies or sweat shirts, shirts, ties, hankies, rain coats, wind sheeters, cargos and jeans are the most common gift ideas with space for large branding at the back and small logo at the chest or pocket area. The printing can be screen or photo quality with added option of embroidery can be done to highlight the brand. 30% of the corporate gifting business is done through apparels and it plays a very important role in the life of all brands. 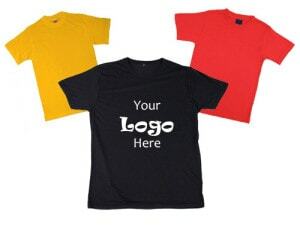 One of the most common item as a corporate gift is t-shirts and very good chances that you will notice a t-shirt in the morning itself while going for a jog or walk. You will notice various t-shirts through out the day and may use one yourself at night while sleeping. BAGS:- The above story can be repeated for the bags too where the newspaper vendor delivers the daily newspaper in the carry bag you have hanged at the door knob with the advertisement of your broadbrand provider. Immediate thereafter the gym bag you are going to use was gifted to you by your local super market to impress you. As you are getting ready for the office you move with the backpack the employer has given you when you were inducted in the organization. The tiifin bag you are carrying has logo of another known brand which gave you the impressive leak proof container in a presentable bag. 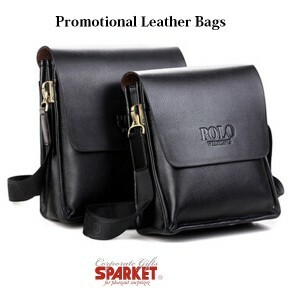 The various other bags are laptop sleeves, briefcases, backpacks, business bags, custom tote bags, coin pouches, leather bags, allied business accessories, imprinted bags, golf bags, shopping bags, portfolios etc. The most common materials used are leather, pu, rexine, cotton, canvas and non woven fabrics to suit different budget and purpose. MUGS:- Mugs are another common gifting item which can be personalised by putting the image of the recipient on the mug. The printing over mug can be done in such a way that the person drinking will notice one message and another message is given to the person facing it. The mug can also be used as the pen holder on the desk or souvenir in the showcase. Ceramic mugs are available both in bone china and stoneware whereas travel mugs comes in with either plastic or steel and even with part steel inside for better insulation. You can select from various capacities, shapes, sizes and even customize the design when quantities are large in your choice of colour. The desired colour or message printing can be done inside too to impress the recipients. DIARIES:- Diaries, calendars, customized note pads, promotional notebooks, organizers, planners etc. can be personalised with the name of the recipient to encourage them to select your gift and use it round the year. Your advantage is that apart from the first few pages you can insert your various product photos at the beginning of every month to keep reminding your target audience about your product or services. You can consider adding a line at the bottom of each page to better connect with the users. Water mark printing can be done on each page to silently enter into the consciousness of the user. The best part is that you are sure of user’s attention for the whole year. LEATHER ACCESSORIES:- Wallets, visiting card holder, key pouch, coin pouch, pocket pad with pen, small card holder, credit card holder, passport holder, cheque book holder, clutches, belts and various combinations of the leather products as business gifts. There is choice of sheep, goat, cow NDM leather etc. when pure leather products are required. To cut down the cost you have choice of leatherette which looks like leather and for very low price target segment wallets can be made of (pu) poly or synthetic leather, rexine, pvc which are welded, pasted or stitched. PENS:- Pens can start from a low of Rs. 2/- and can go up to four figures depending on the brand you shortlist to give as a gift. Our business models is mass so you can get good quality plastic, paper and wooden pens from a single low digit up to high 3 figures made of metal, granites, marbles, brass etc. Branded pens can be provided in lower 4 figures for your esteemed clients. For lower quantities ideally order should be in multiples of thousands for customized colours. For smaller quantities you can select from various ready stocks in all fast moving colours which can be customized with your logo, brand and messages. KEY CHAINS:- Key chain can be made up of metal, rubber, leather, acrylic, wooden, plastic, glass, brass, silicone, crystal in any shape and size imprinted with your message to help remind your customers about your logo, product or brand. Useful features can be designed by adding torch, opener, key finder, led light, screw driver set, lighter, USB, spoon, fork, etc. You can insert photos in the transparent plastic container to impress the users. 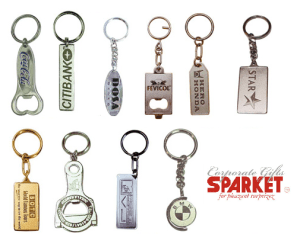 You can also create the shape of key chain as per your products with excellent branding space. The objective and budget can be aligned to catch the attention of the existing and new users from low car Maruti brand to high Honda to luxury Mercedes to super luxury segments Jaguar. CLOCKS & WATCHES:- Clocks are in good demand because in a cost effective manner you can occupy the space on the wall of your customer with enough space for branding to blow your trumpets. Imagine a crowded restaurant which has high footfalls and invariably they will look at the clock for time and also read about you and your products. We have supplied big quantities of clocks to telecom giants, jewellers, fmcg companies. Surprisingly as the clock becomes bigger and displayed at temples, public places, airports and railway stations just the name of the company or brand is enough to get your message across to the viewers. Every desk top item invariably uses a clock to add utitlity to the desk top product. Alarm clocks and table clocks are other useful gifts in the desk top range. But the moment you want to personalized it the watch takes over as the preferred product as the user carries the brand visible to him and few close others who look for the time. And if the watch is a impressive one then the receiver prefers to use that at most of the times. 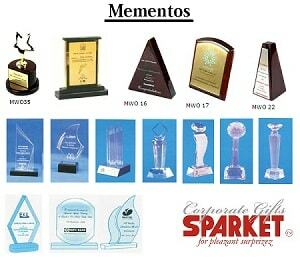 MEMENTOS:- Trophies, shields, cups, plates made of wood, metal, glass, crystal, ceramic, acrylic, brass, gold and silver are much in demand to reward and recognize the performers and to encourage others to aim and strive for the recognition. Schools prefer to have lower budget mementos made of acrylic whereas others decides depending on the event, budget and level of competition. When the idea is sheer recognition then the symbolic gesture is enough but the moment the prestige sets in the budget and design takes over. Bigger the event, the crowd and money involved and the cost of each mementos rises accordingly. Norm is quarterly and yearly performance recognition apart from big milestones like completion of 5, 10, 15, 10 and 25 years of services. MOBILE ACCESSORIES GIFTS:- Mobile has become the most commonly used gadget and almost everyone has minimum one handset. Keeping this fact in mind the most common gift items are mobile power banks, usb chargers, car chargers, various cables, mobile wallets, stylus, stands, screen magnifiers, covers, stickers, screen protectors, ear phones, head phones, bluetooth sets, solar chargers etc. The low price accessory product can be short listed for mass coverage of the target market with branding of logos. If the budget is high then even hand sets can be given as the gift. Pen drives with both sockets for usb and mobile charger are great in demand because ease of use of the drive at both laptop and mobiles. IT GIFTS:- As the users have become IT savvy it makes sense to give related products to impress the target audience. USB fans, lights, cup warmers, fan coolers for laptop, foldable mouses, cables, pen drives, sleeves, head phones, speakers, laptop bags, screen protectors, laptop skins, solar chargers are the most in demand gifts. Pens with pen drive, laser pointers, slide changer are much in demand because of appreciation from the receiver. 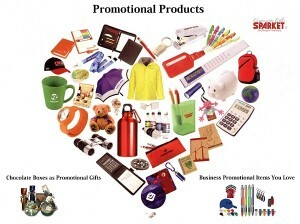 Any new product launched within the given budget is in high demand as an ideal gift to impress the regular audience. TABLE TOP GIFTS:- Personal utility products, table clocks, table top gifts, paper weights, ash trays, staplers, punching machines, paper cutter, scissors, paper knife, mobile holders, pen stand, coffee mug, photo frames, table calendars, wooden table tops, brass table tops, stress busters, table flags, idols, name plates, pen holders are common table top or desk top gifts. Any item which can be kept or displayed at the table is called table top gifts and includes coasters, mouse pads etc. HOUSEHOLD GIFTS:- Flask, tiffin boxes, casseroles, dinner sets, bed covers sheets, blankets, fleece, iron, mixer – grinder, coffee warmer, coffee maker, juicer, mini vacuum cleaner, hair dryer, hand mixer, toaster, pans, non-stick pans, induction cooker, crockery sets, juice glass sets, dinner sets are common household gifts. All gift items which are normally used at homes comes under the household gifts category and the main purpose is to involve the whole family through the gift. WOODEN GIFTS:- As the name suggest all articles made of wood comes under the category of wooden gifts. Wooden gifts starts from the low budget range to high depending on the material used with finishing and polishing. All table top gifts, mementoes, trophies are preferred in wood due to their eco friendly nature and non toxic properties apart from easy availability of the good local craftsman. Complaints are rare due to less breakage and longer usage with variety of choices to pick from at varied budgets. BRASSWARE GIFTS:- Due to golden polish and impressive look the moment budget is respectable companies prefer to give brassware table gifts. The brassware gift is definitely more impressive on the desk due to weight, look and finish with utility as a pen stand with mobile holder and a clock. 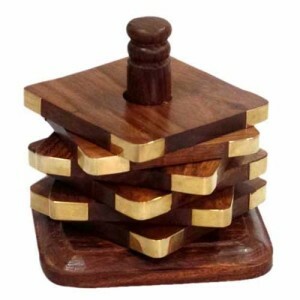 The various other brassware gifts are decision making dices, various stationery gift set, miniature items, mobile stands, money clip, pocket watch, sports related to cricket, golf, stationery items, trophies, mementoes, awards, visiting card box, watch cases, wooden and brass combined world time etc. STAINLESS STEEL GIFTS:- As the name suggest all items made of stainless steel comes under this gift category. Stainless steel gift dinner set of 51 pieces consisting of full plates 6, quarter plates 6, sweet plates 6, vegetable bowls 6, big spoons 3, small spoons 12, glasses 6, water jug 1, serving pots 3, rice plate 1, rice server spoon 1 is always in demand. Even if the receiver already has a set they still look forward to more such sets to keep handy as a good gift at various occasions. Depending on the budget the set can be made for 2 persons instead of 6 and the scheme can be run where partners keep accumulating more items to ultimately make it a set for 4 or 6 persons. Liquor industry does regular promotion of their brands with etching of their logos on napkins holder, ice tray, peanut bowls, salt n pepper, bottle openers, jugs, stirrer, thongs, cocktail shakers etc. Create your own business gift as steel bar set, golf set, dinner set, spoons and forks set, stationery table top gift sets for office including dust bin as complete cabin set as that is a big hit with the receivers. CRYSTALS GIFTS:- Table tops gifts, crockery’s, glasses, bar products, bowls, trays, vases, lamps, trophies, mementos, golf items, idols, table clocks, decanters are all exclusive premium range of crystal gifts. When the budget is not a constraint and idea is to impress the recipient then crystal is an ideal choice. BAR GIFTS:- Liquor industry does regular promotion of their brands with printing on napkins holder, ice tray, peanut bowls, salt n pepper, bottle openers, jugs, stirrer, thongs, cocktail shakers to enhance the ambiance at a bar, club and restaurants. These bar items can be given at various times to encourage your audience to go for the complete bar collections for their own private bars. IMPORTED GIFTS:- Items which comes from China due to low price of production per piece and with acceptable standard quality parameters are called imported gifts. The difference between the chinese gifts available on the roadside and us is that you can catch us for the quality and reliability as we need your business again and again. In our own interest we avoid dealing with untried and untested products. Since we maintain regular stocks and must service all the goods sold, normally all the available products are with warranty for full satisfaction. We do a very tight rope walking with Chinese products with warranty and attractive prices with all taxes and duties paid. STRESS RELIEVERS:- As the desk jobs are increasing and the young working force is getting more and more restless the need of stress massagers is increasing. Ideally it can be in the form of smiley balls which can be given different shapes and size to help the working force release their stress. Also known as stress busters helps in releasing stress by doing some physical activities to break the monotonous nature of the job. Your desired shape and size can be created against bulk orders by making the mould which can have your branding to ensure exclusivity for your Company. MISCELLANEOUS GIFTS:- All the other gifts not mentioned in this article and fails to find the appropiate relevant category can be put under the banner of the miscellaneous business gifts. Grooming kits will be one such product and there are many more such products depending on the availability of the products. New products are added and tried as and when the corporate feels the need or find the right connections to promote along with their products to increase the trial and thereby sales. CONCEPT GIFTS:- When you have a concept which you would like to convey to your target audience then such gifts are called concept gifts. You need to provide us a brief similar to what you give your advertising agency when you ask them to create a campaign. Please also provide the quantity and budget so that the matching concept product identified fits in to your promotional budget. Once you approve the concept then we will give you a proto type for your initial approval and on final approval deliver the gifts to you. An example of concept gift is giving chocolates as personalized mobile numbers of each recipient to their regular lost customers by a telecom company who lost them due to portability of numbers by sending them a message of “we missed you!” and regaining few percentage of them due to this goodwill exercise. We encourage you to add to the list of the above product categories but let there be only business gifts and not personalised or wedding gifts. Personalised gifts like mugs, diaries and pens for example can be added as they are business gifts when overall single combined order is large instead of 1, 2 or very few!